Silver Dollar City is picking up new accolades including a new official world record and selection in Top 10 lists for Christmas lights and celebrations. Silver Dollar City's groundbreaking wood coaster Outlaw Run is featured in Guinness World Records 2015 as the world's steepest wood coaster at its 2013 debut. The inclusion in Guinness World Records 2015 historically documents Outlaw Run’s 81-degree steepest drop on a wood coaster, one of the ground-breaking features of the coaster, which debuted at the Branson, Missouri theme park in 2013. Outlaw Run, which also was the first wood coaster with three inversions, including a double barrel roll, is spotlighted in a section on coaster records. Guinness World Records 2015, distributed in more than 100 countries and translated into 20 languages, is currently on USA Today’s Best-Sellers list, according to the Associated Press. In holiday superlatives announced this week, CNN Travel placed Silver Dollar City in its top 8 list of “Best Places to See Christmas Lights in the US,” along with Disney’s Hollywood Studios and the Denver Botanic Gardens. Silver Dollar City is also a winner in USA Today’s 10Best Readers’ Choice Awards for Best Public Lights Display. The park’s An Old Time Christmas festival, with the Christmas on Main Street light and sound show featuring a musical 5-story Christmas tree, was nominated by experts including editors from USA Today and 10Best.com, and voted upon by readers nationwide. Silver Dollar City was highlighted earlier by the editorial arm of USA Today, which named the park’s Christmas festival one of 10 “Top Spots to See Bright Holiday Lights” (USA Weekend, 11/21-11/23). Fodor’s Travel highlights Branson’s Ozark Mountain Christmas and Silver Dollar City in its “Top 10 U.S. Towns with Huge Christmas Celebrations” list posted December 17, stating “Branson, Missouri doesn’t mess around when it comes to Christmas spirit,” and “Visiting Silver Dollar City’s An Old Time Christmas festival is a must for its 5 million holiday lights and over 1,000 Christmas trees.” The Top 10 towns list also included Historic Georgetown in Washington, D.C. and Christmas Town USA in McAdenville, N.C. Fodor’s is one of the world’s largest publishers of travel information. Silver Dollar City’s An Old Time Christmas runs through December 30, with exact schedules and hours on the website: http://www.silverdollarcity.com, or 800-831-4FUN(386). 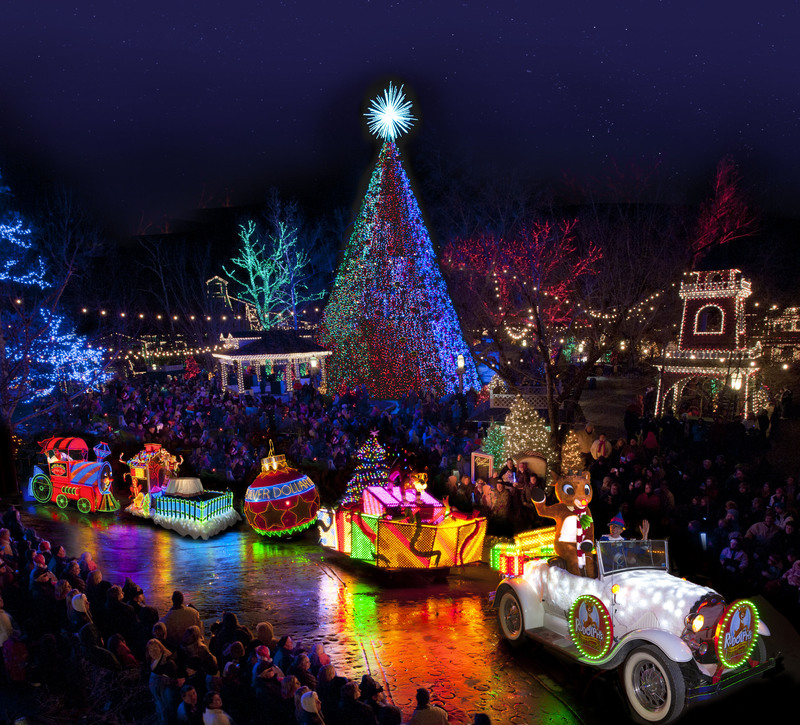 Silver Dollar City presents the new $1 million Rudolph’s Holly Jolly™ Christmas Light Parade for its An Old Time Christmas festival in Branson, Missouri.